I heard myself say it out loud and immediately wanted to take it back. Because it wasn’t true. My husband’s grandfather passed away last month while we were traveling. We were sad by the news and broken over not being able to be with family during that time. But I guess I didn’t feel the loss like he did. Not because I didn’t love Coy’s grandpa but because I didn’t have the same type of history with him. When my uncle passed away two days ago I felt grief. It felt foreign and new to me because I thought I had been feeling it already–over the years–with others who have faced death and tragedy around me as I’ve walked with them through the role as their pastor. For most of us, we don’t grieve like people are dead unless we feel like they are are dead, like their life being gone is going to affect our life as it goes on. And you don’t feel this affect unless you have feelings for them. Since we’re all growing out of selfishness by God’s grace every day, some of us may not be at this starting point but further along. Maybe you can help us with our empathy-by teaching it to us with your lives? A good question for life in general. How do we develop genuine feelings of care and concern for others over time? In life outside of the four church walls as we know them, I’d suggest family dinners with other families, adventures and blunders all wrapped into one, doing stuff together, because in those moments history happen that changes our feelings. It’s impossible to feel the grief that any other person on this planet feels–as we are not them–we have to find ways to say helpful and caring things in the moments that will come our way. * There isn’t a script. * There is no way to change it. * It will feel different for everyone because everyone is different. I was teaching a track for leading middle schoolers through Crisis, Tragedy, and Trauma at OC14 this year. They have an incredible resource that’s offered through their online curriculum. It’s a “say this, not that” help sheet. We all need helps like that, because we can be selfish in our responses if we aren’t careful. 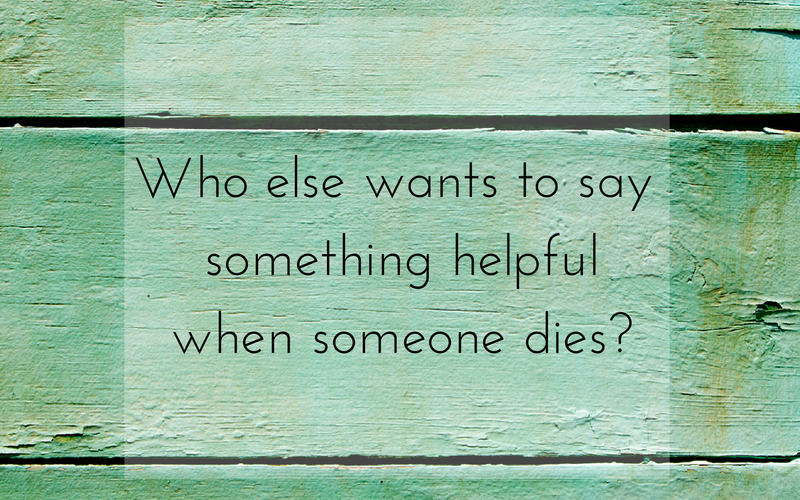 Even though you are full of care and wanting to help our lack of history and ability to feel the level of grief that’s happening with the receiver we can end up saying some not-so-helpful stuff. We’ll be teaching more about this on tour this fall but I did want to share a couple of things that I’m learning as I say goodbye to my uncle this week. 1. Stories beg to be told. My sister was in Paris when my uncle passed. I was in Florida. Our youngest sister unable to get to the hospital. Our brother Matt was in the room with our parents as Kevin took his last breaths. All of us wanting to be there–reached out over the miles through a group text. There wasn’t much to say. Short prayers. Thanks that we had the days we did. But then stories. Mostly in the form of words and phrases “remember this?” “remember that” “i can’t believe that one time”. Healing unfolds in the telling of stories. 2. Follow the imaginations of the grieving. Thinking about how uncle Kevin would have wanted things made us laugh. It’s hard to be sad when we know he’d be telling us to get the food on the grill and the toys in the yard out. Sometimes when people are grieving they make up scenarios or make believe things like the one who has passed is still with us. That is ok. Go there. As long as you need to go there. As soon as Kevin died I wanted to tell someone about what he meant to me. I group texted a few of my friends that he had passed away. They didn’t ask for it, but I followed it with a few long run on sentences about his life and posted a pic on Facebook and told a story on Instagram. I just want someone to know that his life mattered and that the stories matter to me. I don’t need anything else in that moment, just the freedom to let it be known that this person mattered. When there isn’t much to say. Look at the clues and ask questions. Not “how are you feeling” or “is everything ok” but ask what was your uncle like? What made him so special to you? What would your uncle want you to be focusing on as you say goodbye? 5. Accept the endless expressions of grief as unique and welcome them.